If you have chronic fatigue, persistent cough, or a variety of other respiratory issues – these could be symptoms of mold biotoxin illness. Mold biotoxin illness, also known as Chronic Inflammatory Response Syndrome, or CIRS is an illness that’s caused by prolonged exposure to various biotoxins including mold and mold spores. The typical person will become ill with prolonged exposure to biotoxins, but the majority of us will recover quickly once the biotoxin source is removed. However, a small percentage of the population has genes that prevent their bodies from being able to recognize and thus eliminate biotoxins. This then triggers a chronic, systemic inflammatory response. These are the people that develop CIRS. Unfortunately, often times the symptoms of mold biotoxin illness and CIRS go undiagnosed and untreated. This is typically because a patient doesn’t realize they’ve been exposed to a biotoxin over a long period of time and their doctor simply isn’t looking that direction for causation. Many clients we have met with have reported that they are so tired and exhausted that they are barely able to function at a normal level. Some have struggled to maintain a normal home life or even hold down a regular job. When you have chronic fatigue, you may have a hard time getting out of bed. Sleeping twelve hours a day can also be common. Clients have shared that they have bronchial issues, trouble breathing, shortness of breath and consistent coughing that won’t go away no matter what they try, or what their doctor prescribes. Some have said that when they go on vacation, or leave their home for awhile, they feel better. But when they return home, the old symptoms start to occur within 12 hours. Allergic reactions to mold can be as wide and varied as skin rashes, lesions and respiratory issues. Standard medicine typically provides no relief. We see this symptom frequently with our clients. They have a hard time breathing because the biotoxins present in the home are causing their airways to become inflamed. The most common skin issues we have seen with our clients suffering from mold biotoxin illness are eczema and psoriasis. We’ve also seen our clients show signs of skin sensitivity when near chemicals. Showing a heightened sensitivity to chemicals or even chemical odors is another symptom to be aware of. We’ve had clients share that they feel nauseous just walking down a laundry detergent aisle at a grocery store. Perfumes, colognes or other airborne chemicals like Lysol are also known to cause a negative reaction. Achy or cramping muscles is another sign that you may have CIRS. Some clients have said that their muscles hurt all the time and feel constantly achy. A sudden onset of a persistent headache is also a sign of mold biotoxin illness. This symptom is a definite indicator that biotoxins may be present in your home, especially if you rarely get headaches. After being exposed to certain chemicals or molds, those with CIRS may become disoriented to the point where it’s not safe to drive. Another common symptom of mold biotoxin illness is having a hard time recalling words or remembering things. Our clients have reported that simply staying sharp and focused is difficult. MoldPro LLC has helped our clients with these symptoms of mold biotoxin illness by chemically free removing mold in their homes which reduced their mold exposure and provided them with a healthy area to heal from past exposures. If someone does have mold in their home, which is causing any of the above symptoms, hiring a company who uses chemicals can further harm the person who is already ill. The last thing needed is more chemicals sprayed in the home. Further, there are approximately 750,000 types of molds and numerous types of chemicals, some of which are bleach based and peroxide based. Nobody knows what chemical reactions result from mixing mold spores with all these various types of chemicals on the market today. Many of our medical mold removal clients have already gone to a traditional doctor to seek relief from some of these symptoms. A certain medicine is prescribed and when that doesn’t work, normally they will prescribe the same medicine but a higher dose and eventually there isn’t a higher dose available, and still the patient isn’t well. Getting to the cause of the illness is what our clients are seeking, and for them, the original cause of their illness was due to mold. Common causes of mold in a home are due to dampness in the attic due to improper venting, flooding or constant dampness in the basement, unventilated and lack of a moisture barrier in their crawl spaces, and improper bathroom venting. 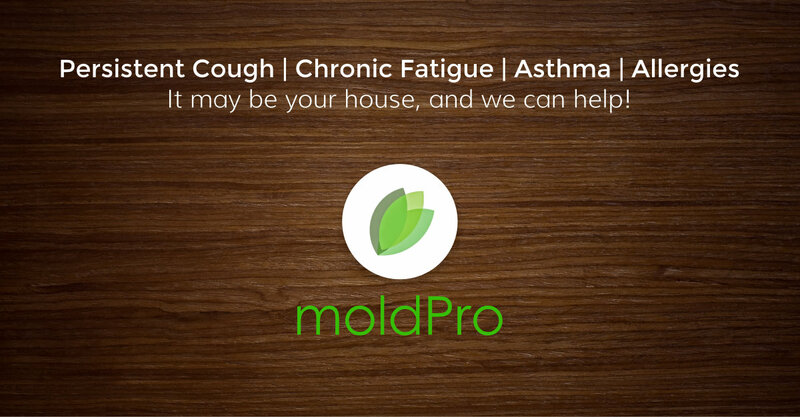 If there is mold issue in a home, which could be causing some of these issues, MoldPro LLC can help. Our team will inspect, test and determine if there is mold in the home, what type of mold it is and come up with a strategy to make the home biologically safe. An important aspect in making someone with mold biotoxin illness finally well is finding the cause. It is the key to permanent and lasting healing. Your Home Inspection States You Have Mold. Now What?